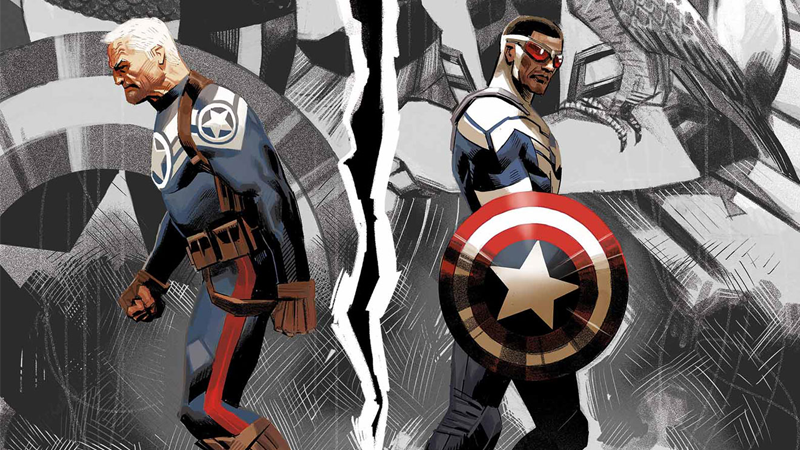 The new Captain America comic, starring Sam Wilson as Captain America, has already drawn some heat for the way it’s shown Sam taking an active role in the politics of the modern day U.S. This is something Steve Rogers himself did throughout his career as Cap—but the second issue goes a long way in highlighting the key difference between Sam and Steve’s approach. Spoilers ahead for Sam Wilson: Captain America #2. Nick Spencer and Daniel Acuña’s second issue doesn’t quite deliver on the follow up to the first issue’s politically-charged story of racist militant groups harassing immigrants at the U.S. border. Instead, it’s an issue of reflection for Sam and his approach to wielding Captain America’s might in the modern day. Although I made the argument last month that Sam’s political activism isn’t out of line with Steve Rogers’ own past, Captain America #2 spends a great deal of time on focusing what made the two men so different. This argument is played out over a flashback to an incident during Sam’s early tenure as Cap, where a hacker infilitrated SHIELD’s systems to blow the whistle on a project where the organization could use reality-altering shards of Cosmic Cubes to literally change existence in the event of major disasters. In the process, the hack revealed confidential information about SHIELD operatives on other missions that could expose them as agents or get them killed. Suffice to say, a bit of a mess all around for SHIELD. Sam’s approach is simple—he makes a public statement to SHIELD to shut the project down immediately, as a danger to the U.S. public. At first, Steve agrees, but it’s the fallout of the decision that sets each hero apart. Following the termination of Project Kobik (under Steve’s own purview), matters turn to the hacker themselves, and it’s where we see these two Caps entirely different stances on what Captain America stands for: to Steve, Captain America services America itself to the best of his ability—and thus the hacker should stand trial and face punishment for illegally accessing SHIELD systems and putting agents in danger, regardless of the end goal of exposing a heinous surveillance program. Sam, on the other hand, believes the hacker was doing a public duty, defending the American people rather than the American system. Steve Rogers believes in upholding the law, while Sam Wilson believes Captain America should be above it. Sound familiar? It’s Edward Snowden writ large, just with Cosmic Cubes rather than the NSA. It’s optimism and faith in doing the right thing, and a skepticism that runs so deeply in many people’s views of the goverment today. Captain America has always been an inherently political figure, but this new storyline is rooted in a modern political debate like no Captain America story there has been in a while. And in the end, it means two of the closest friends in Marvel’s comics can no longer see eye-to-eye with each other.